Welcome to Perth’s friendliest BJJ gym. Do you want to learn BJJ, the world’s most pragmatic and effective martial art? You’ve come to the right place. We can teach you how to defend yourself on the ground while becoming fitter, stronger and more mobile. Newcomers are welcome! We want to help you to become the best grappler you can be. You’ll feel included from day one and will feel confident that your training partners are looking out for your safety. 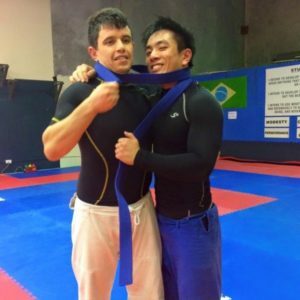 We are Perth’s no-gi specialists. We train entirely no-gi (shorts and rash-guard), rather than gi (belt and kimono). Our focus is fun, performance and results. We respect our traditional roots, but it’s time to modernise BJJ. We’re serious about teaching BJJ. Our instructors have professional experience teaching, mentoring and tutoring at the primary, high school, TAFE and university levels. Our main instructor has over a decade of experience in coaching BJJ. The Martial Arts world has moved on from the domain of tough guys. Sports science is taking over. Thanks to modern practices, we can give you the benefits of Brazilian Jiu-Jitsu much faster than the traditional approach. Our gym is named for the 80/20 (Pareto) principle. The 80/20 principle tells us that if you have ten techniques, you’ll typically use two of those techniques 80% of the time and the remaining eight techniques 20% of the time. This principle guides us to focus our training time on the techniques, concepts and strategies that will yield the most results in the fastest time. We have 200 sq metres of mat-space for BJJ, as well as a smaller upstairs matted area for kids’ BJJ. When you’re in the zone, it’s nice to have the space to spread out and move without bumping into your neighbours. How we run our classes.